1) The reporter in this incident is far from innocent. 2) Trump-haters blame the fury of news coverage surrounding Trump for the billionaire businessman’s rise in the polls. But as Marlow points out, that is absurd. Almost all the coverage of Trump is negative, the kind fabricated guilt-by-association and George Wallace-ing that Stelter and Berg engage in here. RCP’S REBECCA BERG: If we look at these rallies more broadly, it’s a very, very unique dynamic we are seeing only with Donald Trump. We talk a lot about the anger his voters feel. And really, what this reminds me of is George Wallace’s rallies back in the late sixties and early-seventies. Hunter S. Thompson used to describe these rallies as something like a Janis Joplin concert. But what George Wallace did was actually very similar to what we see Donald Trump do today: he heckled his hecklers, he got the crowd very riled up, and we often saw these protests break out, and sometimes some violence. CNN’S BRIAN STELTER: Alex, do you think there’s any responsibility on the part of Trump when he points at the press and he calls them dishonest and disgusting; does he have any responsibility for what happens next at these rallies — if the reporters are criticized by the crowd or manhandled by a Secret Service agent? 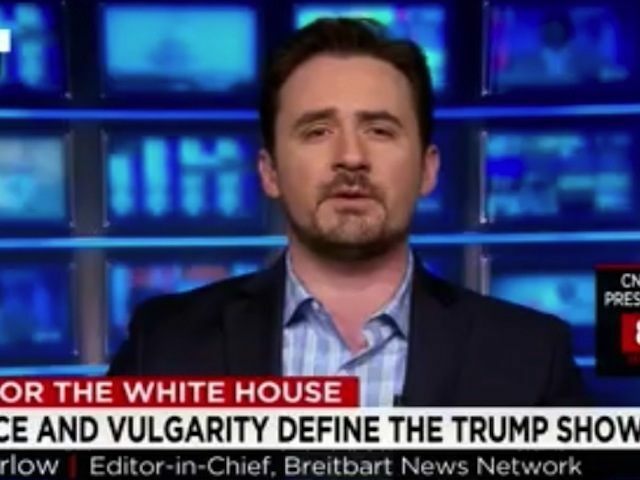 BREITBART’S ALEX MARLOW: I think in this video, if you look at it closely, the reporter is as much a part of this as the Secret Service. The reporter ends up putting his had around the Secret Service member’s neck. STELTER: Some have said that actually happened after — when he was showing what the Secret Service officer did to him. Doesn’t Trump have some responsibility here? MARLOW: Well, there’s a lot of responsibility, but this blows up the myth that any Donald Trump coverage is positive. He’s undergone intense media scrutiny. He’s never been a politician, and look at where he is. If he can just do what he did after Super Tuesday; where he rose above. He was upbeat and positive and took questions from the press, unlike Hillary Clinton, who will not talk to the press, I think he’s not going to have much of a problem.